HTML5 - Crux for App Development?? HTML5 – Crux for App Development?? Rapidly gaining hype and becoming the talk of the town, HTML5 is all geared up to take the process of building applications and websites to an incomparable level. You might agree, embrace, discard or ignore, whatever your call is, HTML 5 will still be the word of thousand mouths. Sticking to the business point of view, many people extract fruitful results out of HTML5 like, Richard Firth, CEO of MIP Holdings comments, “The development of applications is different to developing Web components, because you have to embed the application separately to access the mobile device the application is meant for,” he adds, “HTML5 works as well as the raw application and avoids many of the disadvantages of application development for mobile devices. With the strong foundations set up by previous versions of (X)HTML, we’re coming into a new age with a wealth of knowledge and the ability to learn from our past mistakes.” But where there are predictions, there are contradictions as well. To disagree with Firth’s statement, a recent report from Gartner expressed the outcome of HTML5 in advance. According to the report, HTML5 would require about 5-10 years to become one of the best-suited technology platform for business related concerns. Hype Cycle Report, an eagle-eyed firm that has provided us with a helpful track record since 1995 predicting how technologies would evolve over time, has observed that a technology when introduced in the market definitely faces a “trough of disillusionment” before ascending towards the “slope of enlightement”. Same is the case with HTML5. Graph displayed above clearly demonstrates the phases through which a technology passes. 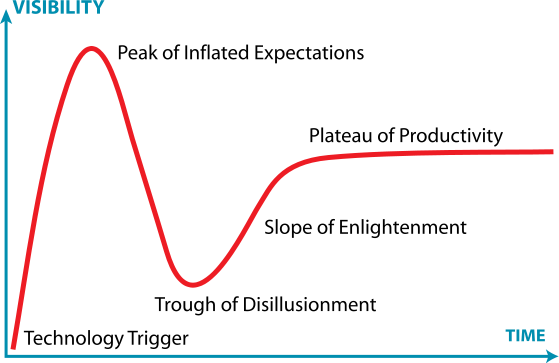 Currently, HTML5 is moving towards the “peak of inflated expectations”, but it will have to go through the “trough of disillusionment” before mounting the “slope of enlightement” in next 5-10 years. On this, Firth commented, “The market is failing itself if Gartner is right about the 5 to 10 year horizon for HTML5, Standards drive who uses technology and how it is used. If HTML5 isn’t accepted as the standard, we will see the same kind of proprietary battles we saw with browsers in the early 90s.”. He also believed that the reason behind Steve Job becoming the proponent of HTML5 was that he was well-aware of the needs and requirements for an open system, that is a standard. He said, “Besides citing technical concerns with Flash, Steve Jobs argued Apple couldn’t allow itself to become dependent on Adobe for critical technology. As a result, on Apple’s mobile devices, Websites that rely on Flash display black boxes where videos or graphics should appear. Adobe rejected this argument, but hedged its bets by developing programming tools that support HTML5 as well as Flash. Adobe has now announced that it will no longer develop new versions of Flash for mobile browsers. This proves HTML5’s ability to create Web apps that work both with Android and iOS. If you want to be delivering a Web experience around multiple devices, you have to be doing it in HTML5″.